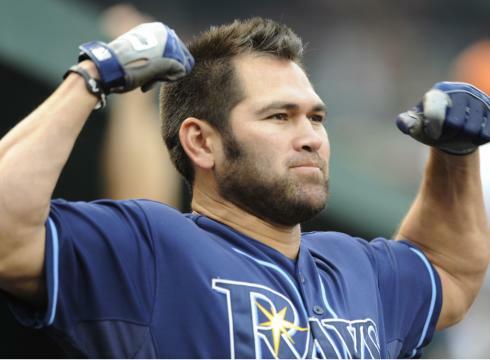 For a guy who was once the toast of Red Sox Nation, Johnny Damon seems to be doing literally everything in his power to make Red Sox fans forget about his one-time status as a Boston cult hero. In 2005 he turned down an offer from the Red Sox to take more money and more years from their arch rival New York Yankees, eventually becoming one of the few (if not the only) player to win World Series with both the Sox and Yanks. Then last year, when the Tigers put him on waivers and the Red Sox claimed him, Damon refused to waive his no-trade clause to go back to Boston. His reasoning at the time was that he was enjoying himself in Detroit and still had hard feelings about the way his time in Boston came to a close. Based on his comments last night to the Tampa Tribune, I’m guessing some of those hard feelings are still lingering. In the wake of the Rays’ improbable come-from-behind 8-7 victory over the Yankees last night which served as the final nail in the coffin of the Red Sox’ historic 9-game September collapse, Damon was asked how this experience compares to other postseason experiences. “You know what, I didn’t think anything would top the (2004) World Series in Boston, but this does, regardless of whatever happens during the playoffs,” Damon said. Last night was a lot of things to a lot of people. As a fan, it was exhilirating to watch a scrappy team like the Rays complete one of the most impressive comebacks in baseball history by vanquishing the Yankees as the Red Sox collapsed in Baltimore despite being one strike away from at least forcing a one game playoff. As a player, especially one in Damon’s shoes having sparked the 6-run 8th inning rally, it had to have been one of those Leonardo DiCaprio “King of the World” type of experiences, the kind where you feel as though you’re invincible, knowing that few have been where you are before and fewer still will venture there again. But this month, this game, was more rewarding than what Damon experienced in 2004? Really? Let’s recap the 2004 Red Sox run, shall we? Down 3-0 to the Yankees with their backs against the wall in game 4 of the ALCS at Yankee Stadium, the Red Sox came back from down one in the bottom of the 9th inning against the greatest closer in baseball history, Mariano Rivera. A Dave Roberts stolen base turned the momentum of that series and the Red Sox became the first team to ever come back from a 3-0 series deficit to win a series, beating the Yankees 4-3 to move on to their first World Series since 1986. The rest as they say is history. The Red Sox would go on to sweep the St. Louis Cardinals in the World Series, their first championship in 86 years, effectively vanquishing all talk of The Curse of the Bambino forever. Damon and his teammates went from mere ballplayers to legends in New England that season, forever turning around the fortunes of one of baseball’s most tortured fanbases. I’m not a ballplayer so I have no way of putting this in context, but winning a game to advance to the American League Division Series tops all that with the Red Sox? Suffice it to say whatever friends Damon had in Boston just vanished. Not only is Damon trivializing the 2004 World Series championship with that quote, he’s rubbing in the fact that he was part of the reason the Red Sox are staying home this October. I’m guessing that’s not sitting well throughout New England today. It’s hard to imagine simply qualifying for the playoffs – regardless of how remarkable of a run the Rays had – beats winning a world championship, let alone one of such historical significance as the 2004 Red Sox title. Perhaps Damon was caught up in the moment as most of us watching from home were last night. Or maybe he actually meant what he said, that the Rays’ 2011 run to the Wild Card means more to him than what he accomplished with the Red Sox, even if the Rays don’t wind up hoisting the championship trophy once this season reaches its inevitable conclusion.